If you scroll through those religious channels on your television, you'll have the disappointing experience of finding quite a few "Word of Faith" heretics (I was into that movement myself for a while, years ago) but precious little in the way of solid biblical teaching. 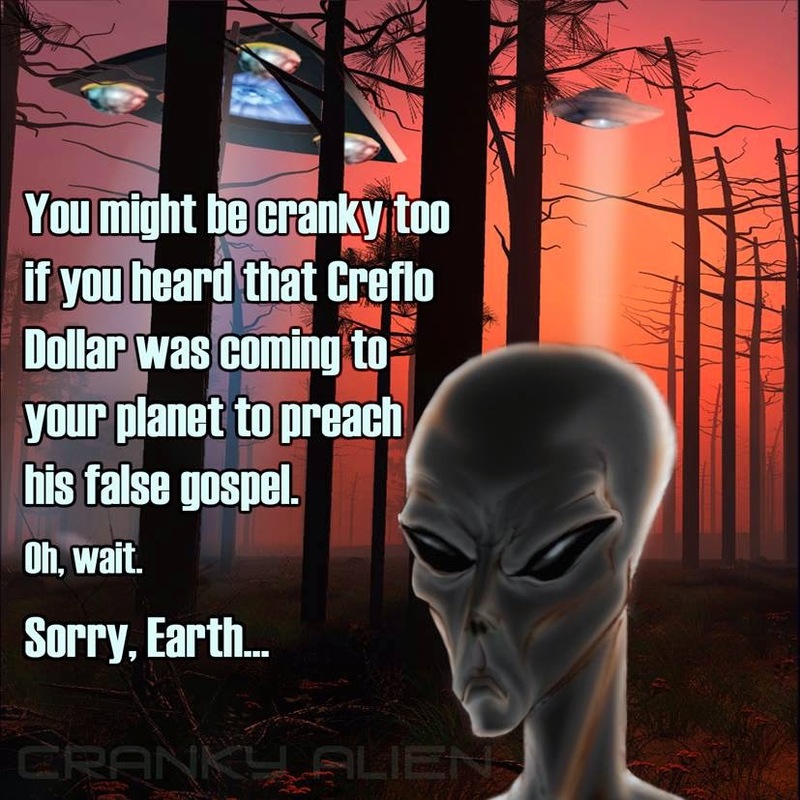 One of the more notorious of those blab-it-n-grab-it preachers is Creflo Dollar. He made big news when he said he wanted a $65,000,000 USD Gulfstream G650 jet. Naturally, there was a huge outcry, and the campaign was shut down. Here's the part that nobody else will tell you, it's been our secret, but now it's time to let you in on it. God put a burr under my saddle by giving me a direct revelation. He spoke to me, saying, "You have two of those jets at The Question Evolution Project. Give him one, and watch me bless you!" Well, we do have a second one that we're not even using, it's on an airstrip at our secret second headquarters, near the velociraptor pens. I called up Creflo and told him to come over and get it. That's why his request was taken down. "Head them off at the pass? I hate that cliché, Cowboy Bob!" Never mind about that now. (But there are people who think I make money doing this, and ignore how I say I have a real job. I even have to work overtime to pay health insurance). After all this fun, (which was unfortunately too late for April 1), I have something a mite more serious to discuss. Dollar lashed back at critics, saying that he has a right to dream big. It's true, anyone has the "right" to dream big dreams, but not to try to obligate God to give you whatever you want, whenever you want it. Something else he said caught my ear like a stray stone kicked up by a galloping horse's hoof. He said that if they discover life on Mars, they'll need to hear the gospel. He's going to have to "believe God" for a billion dollar space shuttle so that he can preach the gospel to them on Mars — but what he preaches is not the real gospel anyway. I reckon that he doesn't know his Bible very well. Although I don't personally believe that there's intelligent life elsewhere in the universe (despite the faith of SETI enthusiasts) because of theological reasons, there's something that Dollar seems to be forgetting: Jesus redeemed people, and there's not one word in the Word about saving other life forms. He is the last Adam (1 Cor. 15:4), not the last Martian. Further, the saving work of Jesus is done. He is seated at the right hand of God the Father (Col. 3:1, Heb. 7:25, Matt. 26:64). You may want to check out the podcast from "Fighting for the Faith", "Creflo's 65 Million Dollar Theological Tantrum". While the whole thing is interesting, the Creflo Dollar part is near the beginning. So, the Word of Faith heretic is lacking in some basic Bible knowledge. Unfortunately, too many people are deceived by Dollar, and others like him. Some of us want to urge Christians to be familiar with their Bibles, have a good doctrinal basis, rely on its authority, and be willing to whip out their Bibles so they can see the Scripture twisting that is going on. I hope and pray you're with us.